In January 2015 I built a new device based on the electronic version of Bennet's doubler, using a tubular construction. 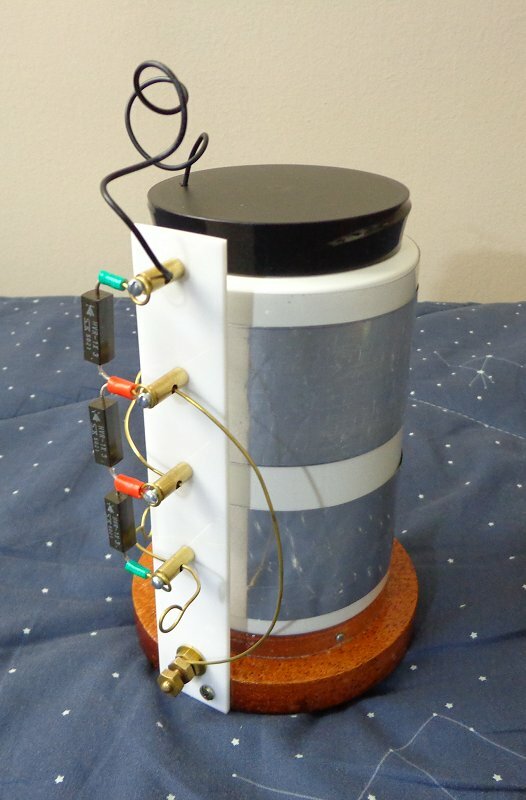 It was made from a section of a PET bottle, a large PEAD pot that fits inside it precisely, thick aluminum foil, some hardware and three microwave oven diodes. Two views of the doubler. The external tube is fixed over a wood base with three little screws. The base has a hole in the center to let the air escape, and three rubber supports. Two aluminum foil cylinders are fixed on it, with adhesive tape. The inner pot has a similar cylinder inside it, aligned with the lower external cylinder when the pot is entirely inside the outer tube. A flexible wire connects the inner cylinder with the terminal at the top. Three high-voltage diodes are mounted as shown in an acrylic plate, contacting, from top to bottom, the inner cylinder, the ground terminal, the upper external cylinder, and the lower external cylinder. The diodes can be easily reversed, by connecting the entire string backwards. 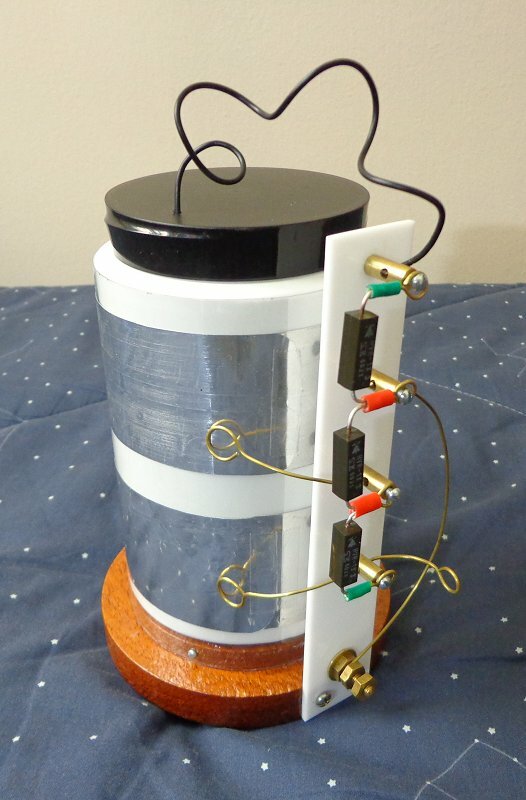 The main output is the lower external cylinder, connected to a simple terminal with a wire ring. The ground connection can be just a chain going to a partially conductive surface where the machine is supported. As the supports of the base are insulating (the ground terminal actually is not in contact with the base, but close to it) the output and ground connections can be reversed if convenient. The machine is operated by raising the internal pot until the internal cylinder is aligned with the upper external cylinder and lowering it again, repeating the operation in rapid succession. With the diodes as shown, with the cathodes pointing up, the machine generates negative output. With the diodes reversed, the output is positive. The machine, starting completely discharged, starts easily, probably helped by triboelectric charges generated by the rubbing of the pot and the tube. When the pot is raised, the output voltage climbs to successively higher levels at each cycle, saturating at about 10 kV, limited essentially by the breakdown voltage of the lower diode. A high-voltage capacitor connected across the output is easily charged. As the polarities of the plates do not change, however, soon charges accumulate at the bare plastic surfaces opposite to the plates, and the machine ceases to operate. It's then seen that the movement does not increase the output voltage significantly, or that the output voltage rises when the pot is lowered instead of when it is raised. The normal operation can then be restored by inverting the diodes, with opposite polarities. The ideal operation of the doubler is as in the diagram above. Starting with the lower external plate and the internal plate oppositely charged as shown, when the pot is raised positive charges are attracted from the ground through D3, charging the upper plate with a copy of the charge in the lower plate. When the pot is lowered, the charge in the upper plate adds to the charge in the lower plate through D1, while the charge in the internal plate is doubled too through D2 and the ground. 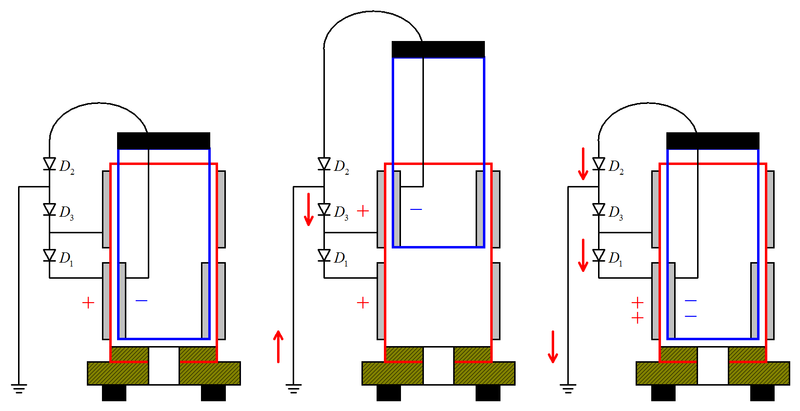 In practice the doubling is not complete due to stray capacitances and leakage. Video of the machine in operation.